UPDATE: This alert has now been upgraded to a Winter Weather Advisory, which will be in effect from 6 a.m. to 3 p.m. on Friday. A quick burst of wintry precipitation could lead to some travel issues on Friday morning. 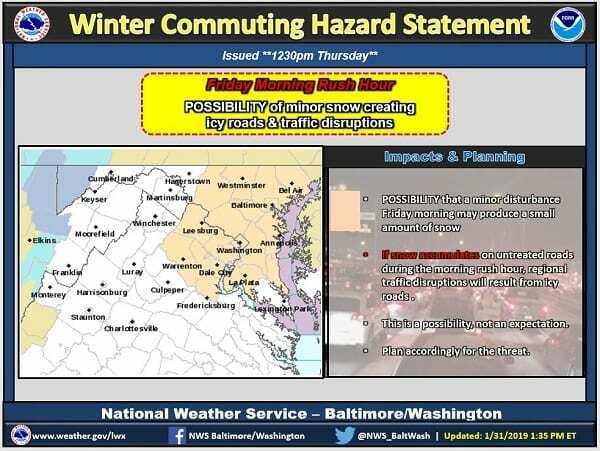 The National Weather Service has issued a Winter Commuting Hazard Statement for portions of central, northeast, and southeast Maryland, the District of Columbia, and northeast Virginia. Motorists should be prepared for a quick dusting to1″ of snow to fall during the Friday morning rush hour and be on the lookout for slippery or icy roads. The NWS adds that this is a possibility, not an expectation.